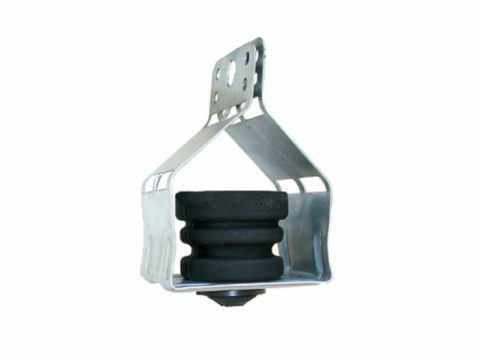 The silicone anti-vibration hangers Vibro.SiL-CHmini can offer vibration protection in demanding vibration control applications for suspension of fans, exhaust gas pipes muffler hanger and other sensitive electronic equipment, audio speaker systems, special in avionic, marine, military and medical applications, where a wide temperature range (-40 to +200°C) occurs. Suitable also for food-industry applications (bakery ovens, refrigeration rooms etc). Vibro.SiL-CHmini consists of galvanized steel metal frame with appropriate-positioned notches and the antivibration rubber mount VIBRO.SiL-mini. The advanced design of Vibro.SiL-CHmini provides an effective shock and vibration isolation protection, as well as structure-borne noise reduction, much higher than natural/synthetic rubber. Silicone gel pads can achieve a large deflection capacity and a low resonance point. It offers very good weathering properties, ozone UV resistant. Suitable for frost and snow conditions. Silicone gel is softer than natural/ viscoelastic rubber and other thermoplastic compounds, with low compression set. Usually, the metal frame is delivered in flattened form. The metal frame can be easily transformed to any of the 3 forms shown in the figures. • SHAPE (2) can be fixed with 2 anchors on the ceiling. • SHAPE (3) can be hanged with a hook. Silicone gel pads can achieve a large deflection capacity and a low resonance point. It offers very good weathering properties, ozone UV resistant. Suitable for frost and snow conditions. Silicone gel is softer than natural/viscoelastic rubber and other thermoplastic compounds.